Rub in 4 large plates with the clove of garlic before loosely arranging the slices of ham thereon. For the vinaigrette, stir the vinegar with salt, pepper and sugar. Then slowly add the oil and thoroughly mix it in using a whisk. Clean the onion and bell pepper and finely dice. Wash the herbs, cut the cress and slice the chives into fine rings. Stir everything into the vinaigrette and distribute over the ham-Carpaccio. Serve with baguette. Coarsely grate the potatoes into a bowl, with skin. Lightly braise the diced onion in 1 tbsp. of oil, add the stock and bring to a boil. Add to the grated potatoes. Season with apple vinegar, salt and pepper. Add the chopped herbs and the remaining sunflower oil, then carefully fold it in. Decorate with blossoms (e.g. rose blossoms, violets, daisies, dandelion, and pansies). Cut the Black Forest ham in wafer-thin slices and serve. Cool the avocados in the fridge, then halve them and remove the pips. Sprinkle some lemon juice onto the fruit. Beat the sour cream until it is viscous. Finely dice the Black Forest ham and the pineapple, before mixing it with the sour cream. Season with lemon juice, sherry, Cayenne pepper and salt and fill it into the avocado halves. Cut the white bread into various forms or cut out the forms by using a sharp knife. Heat clarified butter in a pan, halve the garlic and add it. Bake the bread pieces until they have a golden-brown colour on both sides. Drain excess fat onto kitchen paper and let the croutons cool down. Gently rub them in with the pealed clove of garlic. Present the avocado halves on 4 plates, then garnish with the croutons and parsley according to taste. Sautée the scallions in a small amount of oil, add the garlic, thyme, bay leaf and vegetable cube and also braise. Add the pearl barley, without the soaking water. Deglaze with white wine, pour in the hot chicken stock and simmer at low heat. The pearl barley has to be quite soft. One can still refine the risotto with freshly chopped herbs. Sautée the scallions in butter. Add the bay leaf, thyme and garlic and then the flour, before braising it for a short time. Then deglaze the roux with white wine and Noilly Prat and pour on the hot chicken stock. The sauce should simmer for at least 20 minutes at low heat. During this time, briefly sautée the spinach and the bear’s garlic in a little bit of bown butter and then shortly braise with a small scallion. Thereafter add this to the sauce. Finely blend in a mixer. Strain the sauce, stir until cold on ice and put aside. Spread out the Black Forest ham on a moist cloth, reaching a height of approx. 15 cm and a width of approx. 20 cm. Place a slice of boiled ham on top and two slices of cheese on top of this. In the centre of this mat of ham and cheese, the pearl barley risotto is placed lengthwise. Then roll it up so that the ends are closed. Place the cannelloni in a fireproof dish and pour over the bear’s garlic sauce. Sprinkle over the parmesan cheese. Bake in the oven at a recirculating temperature of 160° C for approx. 15 to 20 minutes. Preparation: Cut the cooled Schäufele (shoulder of pork) into slices, each with a thickness of approx. 0.5 cm. Rub a clove of garlic onto four plates and place two slices of the Schäufele (shoulder of pork) onto each plate. To make the vinaigrette, stir together the vinegar with the salt, pepper and sugar. Then slowly add the oil to the mixture and thoroughly beat the vinaigrette with a whisk. Once finished, add the herbs, the cut cress, the chives and the finely diced onion and pieces of bell pepper to the vinaigrette and evenly distribute this over the Schäufele (shoulder of pork) slices. Thoroughly knead the ingredients for the pasta dough until smooth and shiny. Let the dough rest in a floured cloth for 30 minutes. Then roll it out thinly and cut into 8 x 8 cm large squares. 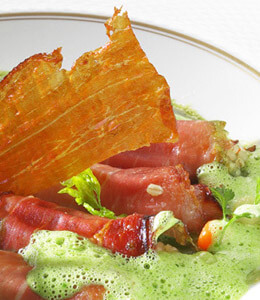 Cut the celery into fine slices and mix with Black Forest ham and Crème fraîche. Place a portion of the filling onto the halves of the pasta squares and gently press down using the back of a knife. Let it boil in hot salt water for approx. 4 minutes. Heat the chicken stock. Scald the tomatoes before removing their skins and the seeds. Then dice. Glaze the tomatoes with the chopped onion and spices in butter for 10 minutes. Deglaze with sherry and chicken stock, slightly boil it down and press it through a hair sieve. Place the sauce on 4 plates and place the Swabian ravioli on it. Serve with chervil or fresh basil. Gently braise the finely diced onion in butter, add flour and fill up with fish stock, white wine and cream. Let it simmer for approx. 3 minutes, season with salt and pepper and add the finishing touches with the finely chopped thyme. Gently tenderise the fillets of trout underneath cling wrap and then place a wafer-thin slice of Black Forest ham onto every trout fillet. Place a piece of trout fillet and some chopped flat parsley on it. Bread the trout fillets in flour, egg, bread crumbs and fry in some butter for approx. 4 minutes on each side. Finely chop the stinging nettle or the leaf spinach and braise it in butter, add 2 tbsp. of vegetable stock. Braise in a closed pot for 2 minutes. Cut open the Cordon Bleu of trout and arrange it on the bed of stinging nettle and spinach. Spread the thyme sauce along the outside of the food. Home-made noodles or mashed potatoes are the ideal accompaniment for this. Heat the clarified butter and braise the finely diced onion therein. Then add the kraut and heat the mixture. Peel the apples, finely dice them and mix into the kraut. Place the slices of Black Forest ham next to each other on the foil, sprinkle with bread crumbs, place the apple and kraut mix on top and roll it up. Peel the potatoes, coarsely dice them and pre-cook in the beef stock. Butter a fireproof baking dish, fill with the cooked diced potatoes and place the ham rolls on top. Heat the gravy, sprinkle in the fried onions and pour the sauce over the ham rolls. Bake in the oven for 30 minutes at 160° C.
Take the flour, egg, milk, cream and a spoon of olive oil to make a smooth pancake dough, then season it with salt and pepper. Fry the slices of ham in a hot pan and cover with the thick dough. Turn the pancakes and bake on both sides until golden brown. Mix the vinaigrette using the scallion, 1 tbsp. of mustard, olive oil and white Balsamic vinegar. Season according to taste with salt and pepper and then refine with herbs (e.g. chervil, coriander, parsley etc.). Clean and wash the rocket (roman rocket) and basil, then mix it with the dressing. 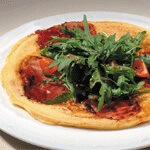 Place the salad in the centre of the still warm pancake.